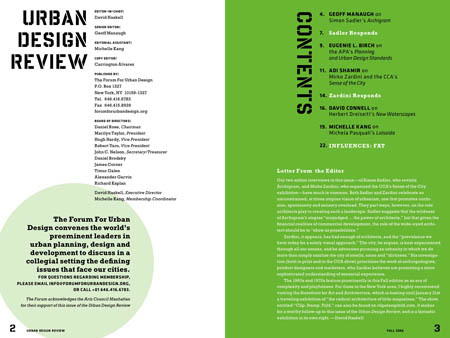 I'm a bit late but no less excited to announce a new issue of the Urban Design Review, published by David Haskell's Forum for Urban Design, and for which I serve as Senior Editor. The new issue starts off with my own review of Archigram: Architecture Without Architecture by Simon Sadler. Enthused designs gave Archigram a relentlessly upbeat group persona that belied the romantic melancholy dwelling within. For each optimist in the group poring over a drawing board late at night, one might have found another member brooding uncertainly over the purpose of architecture, though such vocational misgivings were barely apparent to Archigram's public. Even the group's shared technophilia blurred a varied set of personal responses to architecture. The short treatment this topic receives is a pity; I, for one, appreciate seeing the apparently univocal edifice of Archigram chiseled down to its component personalities." In any case, I then interview Sadler – and find, interestingly, that much of what he has to say preempts some of my larger thematic or structural problems with the book. Thus the value of dialogue. The issue then turns to Eugenie Birch, Chair of the City and Regional Planning Department at the University of Pennsylvania. Birch takes us through the new Planning and Urban Design Standards, as they've been codified by the American Planning Association. 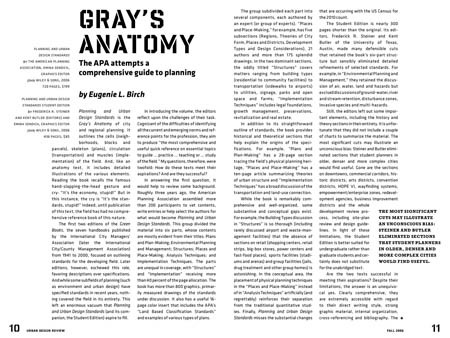 The book is "the Gray's Anatomy of city and regional planning," Birch writes – referring, of course, not to the American television serial. "While the book is remarkably comprehensive and well-organized," she continues, "some substantive and conceptual gaps exist. For example, the Building Types discussion in 'Structures' is so thorough (including rarely discussed airport and waste-management facilities) that the absence of sections on retail (shopping centers, retail strips, big-box stores, power centers and fast-food places), sports facilities (stadiums and arenas) and group facilities (jails, drug treatment and other group homes) is astonishing." Birch's review led me to something of a literary epiphany, however. While I have long argued that what makes the novels of J.G. Ballard so architecturally interesting is that they are set in a world of abstract suburban environments – business parks, media centers, etc. – it had never occurred to me that you could simply flip through something like the Planning and Urban Design Standards guide and choose such settings at will. In other words, if you're sitting at home right now trying to write a Ballardian novel – or even just a novel – then you could do much worse than simply skimming the Planning and Urban Design Standards and selecting an airport, a big-box store, a sports arena, and a drug treatment facility (grabbing one each from Birch's lists of building types, above – or a waste-management facility, a shopping center, a baseball stadium, and the local hospital – because, either way, you've now got a Ballardian landscape fit for fiction. Though that last combination sounds more like Don DeLillo. Which just proves my point, really: if you select a few random and abstract locations, such as those descibed in Birch's review, then you more or less have at your disposal the necessary physical infrastructure for writing a contemporary novel. I know that sounds incredibly, even stupidly, obvious; but imagining J.G. Ballard reading Planning and Urban Design Standards out in some bar near Woking suddenly seems like a realistic possibility. Is it possible that today's novelists don't need the Iowa Writers Workshop at all? A resounding yes. Is it possible that today's novelists simply need a copy of the Planning and Urban Design Standards guide...? Adi Shamir then takes us through a new volume published by the Canadian Centre for Architecture. That book discusses sense and the city, or how urban space is materially experienced by moving bodies. David Haskell then interviews Mirko Zadini, the book's editor, giving Zardini a chance to respond to Shamir's review. 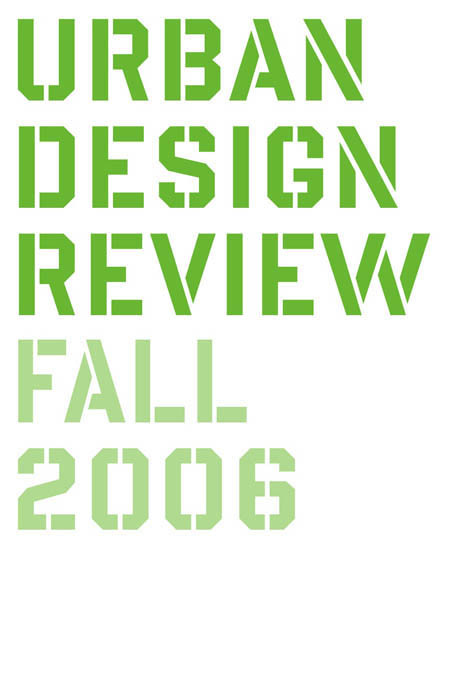 Last but not least are two great reviews, one by The Dirt's former blogmeister general, David Connell; the other by the Forum for Urban Design's own Michelle Kang. 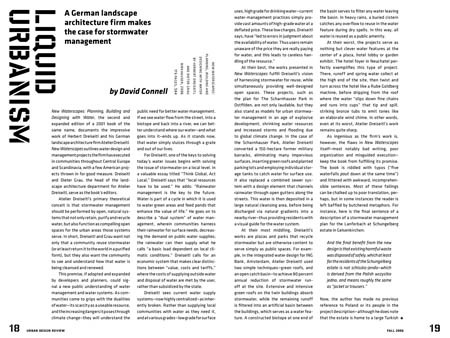 In the former review, you can read about German stormwater management practices, as well as avant-garde public fountains; in the latter, you can read about the community gardens of Manhattan's Lower East Side, which Kang beautifully refers to as the "renegade greenery" of New York City. 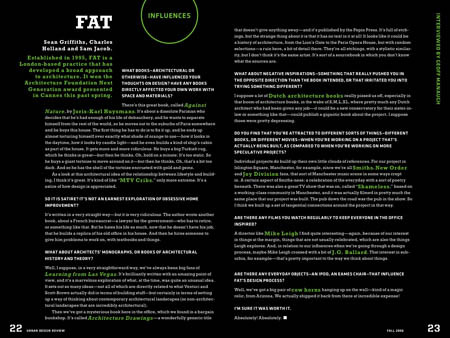 Finally, then, the issue ends with a short interview with FAT, or Fashion Architecture Taste. Specifically, I talked to Sam Jacob – whose blog Strangeharvest is always worth a look, including yesterday's post about the most visited site in the UK (it's not Stonehenge) or this older post about a cave shaped like Nelson's Column. Jacob discusses the music (Joy Division), films (Mike Leigh), and even cow horns that have inspired his architectural practice. There’s this great book, called Against Nature by Joris-Karl Huysmans. It’s about a dissolute Parisian who decides that he's had enough of his life of debauchery, and he wants to separate himself from the rest of the world, so he moves out to the suburbs of Paris somewhere and he buys this house. The first thing he has to do is to fix it up, and he ends up almost torturing himself over exactly what shade of orange to use – how it looks in the daytime, how it looks by candle light – and he even builds a kind of ship's cabin as part of the house. It gets more and more ridiculous. He buys a big Turkish rug, which he thinks is great – but then he thinks, Oh, hold on a minute: It’s too static. So he buys a giant tortoise to move around on it – but then he thinks, Oh, that’s a bit too dark. And so he has the shell of the tortoise encrusted with gold and gems. As a look at this architectural idea of the relationship between lifestyle and building, I think it's great. It's kind of like MTV Cribs, only more extreme. It's a satire of how design is appreciated. And if any of the above sounds interesting, be in touch: we're always looking out for books to review or people to write for us. (Previous issue of the Urban Design Review discussed here).